Purchased 500 of these recycled cotton grocery bags for my business. Really pleased with how the results turned out. The bags are very durable! Thanks CEP. This bag was the perfect fit for my business. Bought these in a bulk order recently and they went over really well. Thank you Custom Earth Promos. I own a supermarket and decided to invest in Custom Earth Promos recycled cotton grocery bags for my store. I ordered 10,000 just to start with and so far so good. Glad I found out about you guys. Bought these bags for an upcoming event. They went over very well. Eco-friendly bag and very durable to hold a good amount of items. Will be doing business with CEP again without a doubt. Very well made bag with superb material. Durable and long lasting too! Highly recommend everyone using this company for eco-friendly and custom-made bags. Very excited to receive our custom reusable totes. We wanted to make a eco-friendly statement to all of our clients. There is no better way then recycled reusable bags with our brand printed on it. I ordered these bags for a company event! They were so great and my customers love them! Thank you CEP! We ordered this bag from them last year and it was a success at our event. I plan on re-ordering this year. This bag is perfect for our firms career fairs. We reorder this product and a couple other bags and products form them all the time. This bag was crafted to our expectations and the service was top notch as far as our order was concerned. I highly recommend custom earth promos. I worked with there custom graphic artist on our reusable bag project. They were great to work with and helped alot since I had no idea what to put on our bag. After now receiving the bags we are very happy and looking forward our event. The customer service was great, as was the construction quality. I order this bag and another model from them all time. Cool bag, I like the overall size we did not need to customize too much from the standard model. I love this bag, I re order it all the time. My customers love it also. We did multi colors for our bag, the print was complex and it came out exactly the way we wanted. good size for trade shows, your customers and event attendees will use the bag right away and will continue to use promoting your company. This is something we order every year at the beginning of the school year to hand out to all of our staff and our students. They really appreciate the gift and they use it throughout the year. We have now been doing this for 5 years, and I still see the bags being used from 5 years ago. This is a testament to the durability of these organic cotton bags. Our Promotional Recycled Cotton Grocery Bags are the perfect way to promote your business while also sending a positive message to your clients about the importance of preserving our environment (which they will, in turn, reciprocate by telling others and spreading your brand). Arriving in a subtly natural hue, your brand’s design will be highlighted within a significantly large imprint area. Functionally, this tote is also a winner. Made of recycled cotton, it is incredibly durable and its robustness is further assisted by lengthy 26” handles and recycled cardboard inserts. A combination of toughness and elegance, our Promotional Recycled Cotton Grocery Bags allow you to advertise your business in style and in an ecologically friendly manner. Made of 100% organic cotton, its durability is unquestioned and is unbelievably made even stronger by the addition of recycled cardboard inserts which act to maintain and enhance the tote’s structure. Your chosen design will stand out admirably against a naturally colored color. Clients, both current and prospective, will be amazed by the bag’s functionality, chicness, and green nature! Our Promotional Recycled Cotton Grocery Bags will be a perfect addition to your clients’ everyday belongings, sporting a great balance between durability and style! 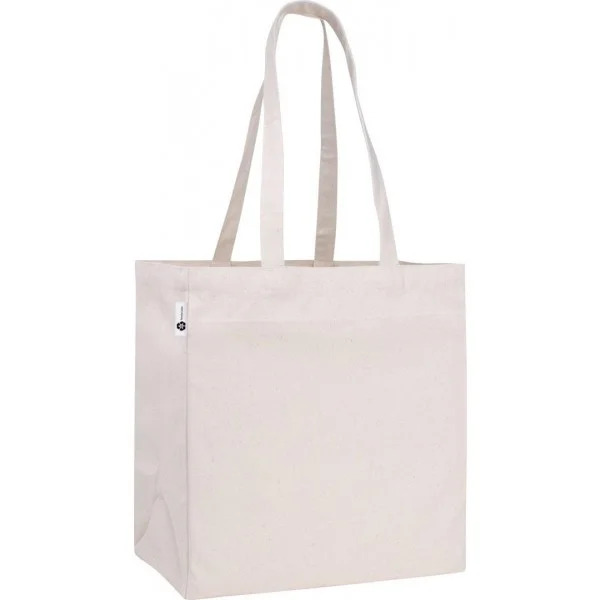 Made of recycled, biodegradable, organic cotton, this tote is incredibly hardy and can withstand even the most intense shopping trips by your clients. In addition to the material by which it is manufactured, it is bolstered by recycled cardboard inserts which help to maintain the structure of the tote and help prevent any rips or tears that may arise in conventional tote bags. Its functionality is furthermore underscored by the inclusion of 26” handles which serve to add both comfort and adjustability. You will have no issue convincing others of your brand’s message with this tote. The subtle natural color of the bag acts perfectly to contrast the design of your choice and make said design stand out vividly on the tote’s backdrop. The large 9” W x 9” H imprint area furthermore aids in highlighting your brand’s prominence as well as the boundless customization options available to you. Finally, each of these totes is made in only the most ecologically responsible manner possible. No harmful byproducts or chemicals are produced in the manufacturing process so you can be assured that our product is entirely green. Combine the aforesaid functionality and aesthetics of this tote and its purchase is a no-brainer for even your most discerning customers! We at Custom Earth Promos understand that time is of the essence when ordering in bulk. Therefore, we, alongside our incredibly capable overseas manufacturing facility, ensure that production and delivery of your items is completed in only the timeliest manner. 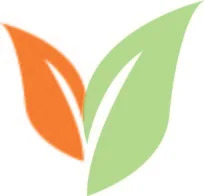 Your satisfaction is paramount to us and we are thrilled to offer all of our products at reasonable, competitively-priced rates.